FedEx vs UPS: Who does it better? If you’re new to the shipping world, UPS and FedEx probably look the same to you. Both are express couriers that offer better tracking and faster service than government postal services. Still, these two ARE competitors, so what’s really the difference between them? Is FedEx or UPS cheaper? Who offers better service? Who's more reliable? Cross-country domestic shipping between cities? Cross-country domestic shipping between rural areas? UPS uses different volumetric weight formulas when you’re shipping domestically and internationally. For FedEx, the volumetric weight for a 13” x 12” x 2” box, regardless of whether it’s being shipped internationally or domestically, is 3 lbs. What does this mean? If you plan on shipping something that is 2 lbs domestically using a medium sized box, UPS would give you a better rate over FedEx. Both companies offer similar, time-sensitive services at very similar rates. 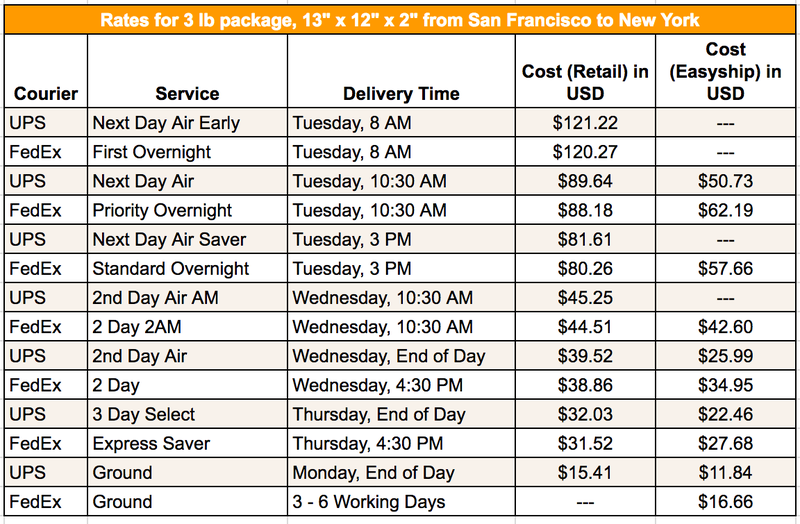 Overall, FedEx’s rates are cheaper than UPS in this scenario. For some reason, FedEx did not provide a quote for their Ground service, so we will assume that UPS provides the cheapest rate for ground service if you are shipping a small package cross-country. In our first example, FedEx’s retail rates were cheaper than UPS’s. However, it turns out through Easyship, UPS ends up having the better rates. 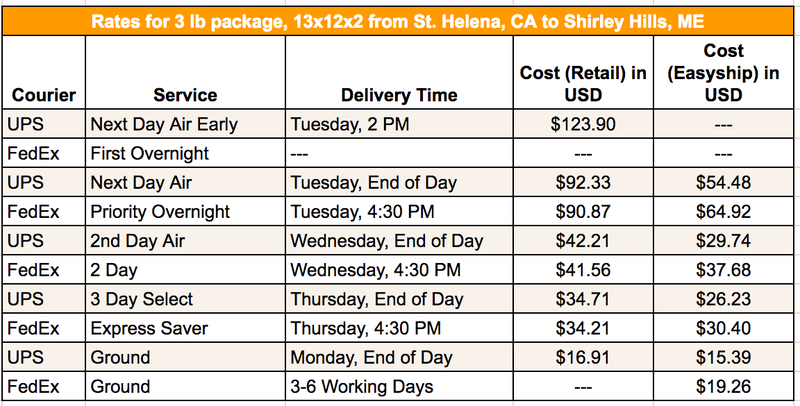 Conclusion: When sending a small package cross-country, FedEx provides cheaper rates if you are paying retail price. If you use Easyship, UPS will have a better rate. 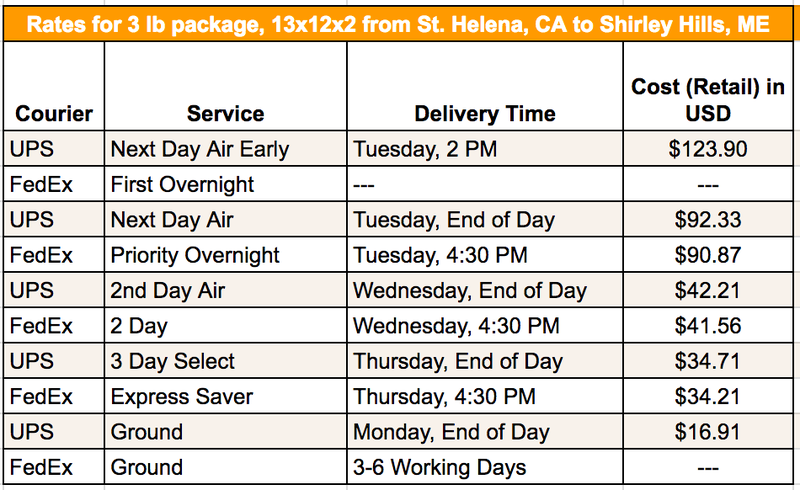 Express couriers are known to add additional surcharges for remote area deliveries, so we wanted to see how much more it would cost to ship a small package cross-country from one rural area to another. For this example, I chose to ship from a small town in California to a remote town in Maine. Surprisingly, rates are not that much more expensive. 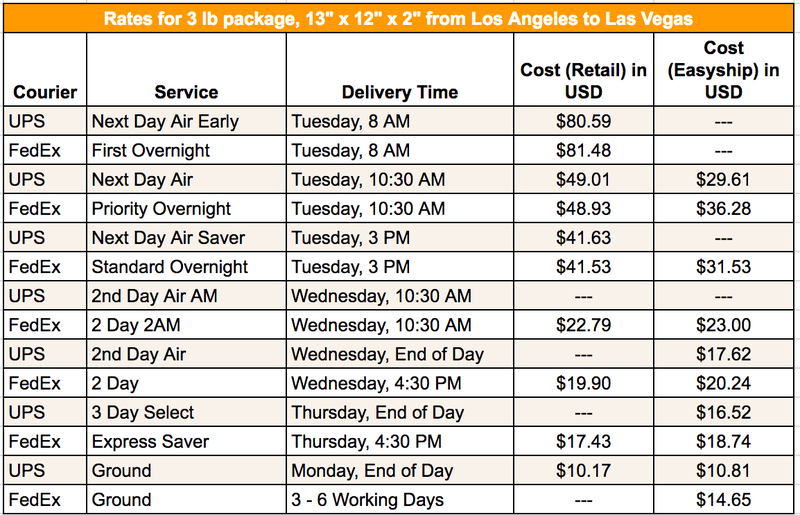 For example, shipping between two major cities coast to coast via UPS Next Day Air cost $89.64, whereas doing something similar between 2 rural towns coast to coast turns out to be $92.33 – and this is with a remote area and fuel surcharge included. A notable difference is that there are less amount of services to remote areas than if you are shipping to a major city. Additionally, in this case, UPS offered one more service than FedEx did. Just like our last case, FedEx retail rates were slightly cheaper than UPS. However, if you use Easyship, UPS will give you a better rate. Conclusion: When sending a small package cross-country between rural towns, FedEx provides cheaper rates if you are paying retail price. If you use Easyship, UPS will have a better rate. In this case, UPS offered one more service option to this remote area than FedEx did. When it comes to short distances, rates for both are very close. Sometimes the difference is less than a dollar. With Easyship’s rates, you can save more if you use FedEx or UPS’s overnight services. With the exception of early overnight delivery, FedEx still has the cheaper retail rates overall, and they happen to have more services for this example. 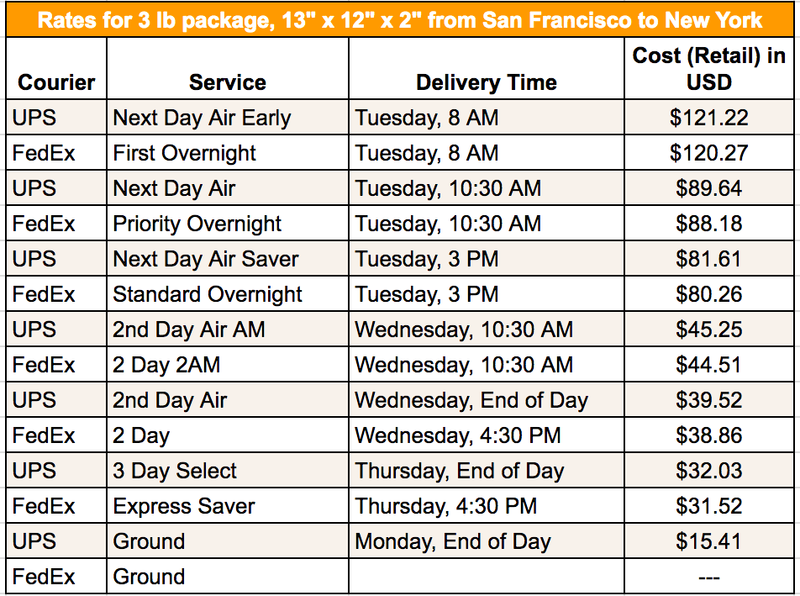 If you use Easyship, UPS still has the cheaper rates, especially if you’re looking for Ground services. Conclusion: When sending a small package at shorter distances, FedEx provides cheaper rates if you are paying retail price. If you use Easyship, UPS will have a better rate. Last but not least, how do the couriers compare when you are shipping internationally? Let’s look at the quotes from San Francisco to London. 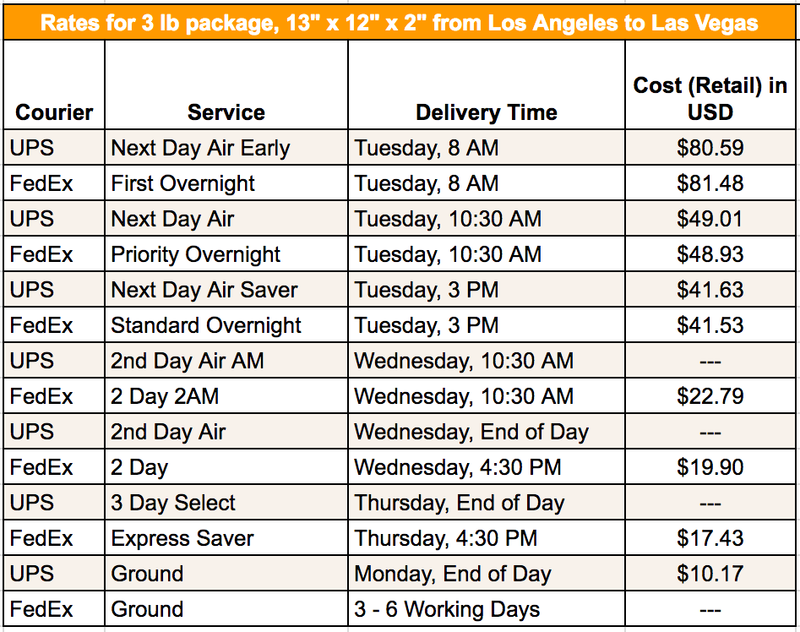 With the exception of FedEx International First service, FedEx again has slightly cheaper rates than UPS. However, it appears that UPS offers one more service than FedEx does in this example. Conclusion: When sending a small package internationally, FedEx (for the most part) provides cheaper rates if you are paying retail price. If you use Easyship, FedEx also has the better rates. UPS vs FedEx: Which is best? Looking back on our examples, both UPS and FedEx had extremely similar rates, reliability, and service options. But if we were to choose a winner based on retail rates, FedEx wins in all four of our examples. However, when using Easyship, UPS had more favorable rates, with the exception of shipping internationally - FedEx still had the cheaper rates. If you plan on shipping something that is 2 lbs domestically using a medium sized box, UPS would give you a better rate over FedEx. Rates drop dramatically at the 2nd day mark when you’re shipping domestically. If you need to send something right away but the overnight rates are too high, 2nd day is your best bet. When deciding between the two, it may come down to the amount of services offered for your route or the timing that you need your package delivered, as these were the only factors that differentiated the two when prices were extremely similar. And trust us – it's a lot easier to compare rates when you use our rate calculator or the Get A Quote function on our dashboard. See everything in one place and easily sort all quotes by cost, delivery time, or best value for money!